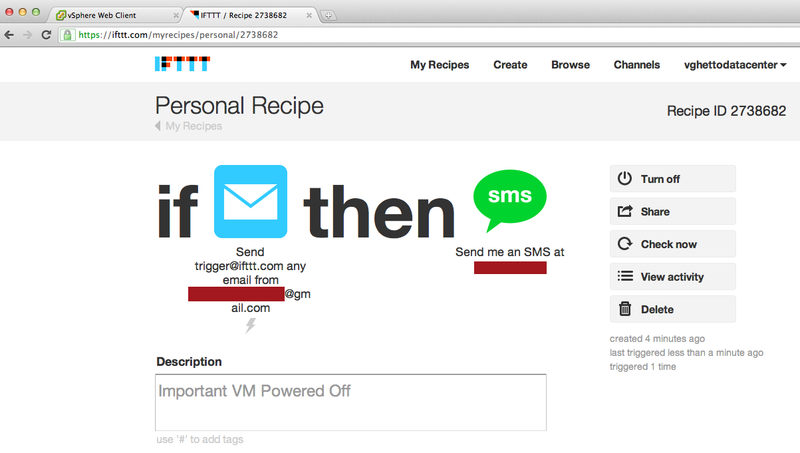 I just discovered a pretty cool free online service called IFTTT (If That Then This) which allows you to easily create what is known as a recipe that is composed of trigger and an action to send a notification. This can be thought of like a vCenter Alarm with a trigger and action, but in IFTTT's case, a trigger and action can be almost anything such as an email, facebook event, twitter, etc. I stumbled onto IFTTT while going through some of my unread blog feeds this morning since I could not go back to sleep after randomly waking up at 4am in morning. I was reading an article from Matt Cowger about something called a Pebble which I had not heard of before and it peaked my interest. In reading about Pebble (pretty slick actually), I learned about IFTTT which is one of the notification systems Pebble supports. 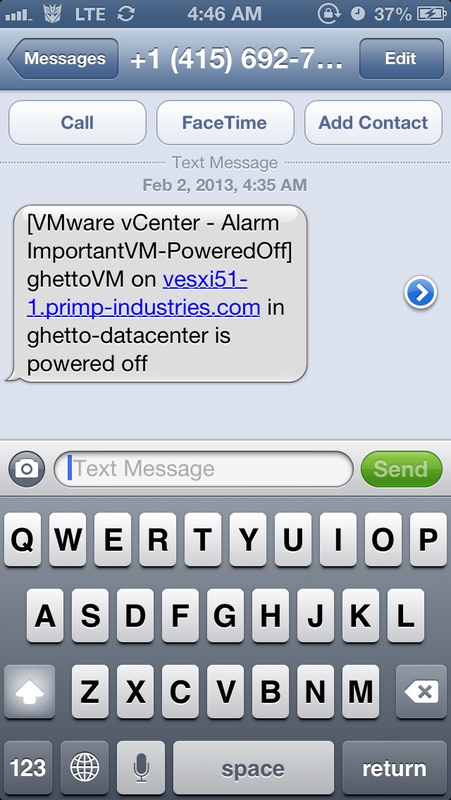 I decided to give IFTTT a try and to see how easy it would be to setup SMS notifications for a vCenter Server alarm. Step 1 - Sign up for IFTTT account, you need to ensure the email account that you use to register is the same account that will be used to send the trigger. 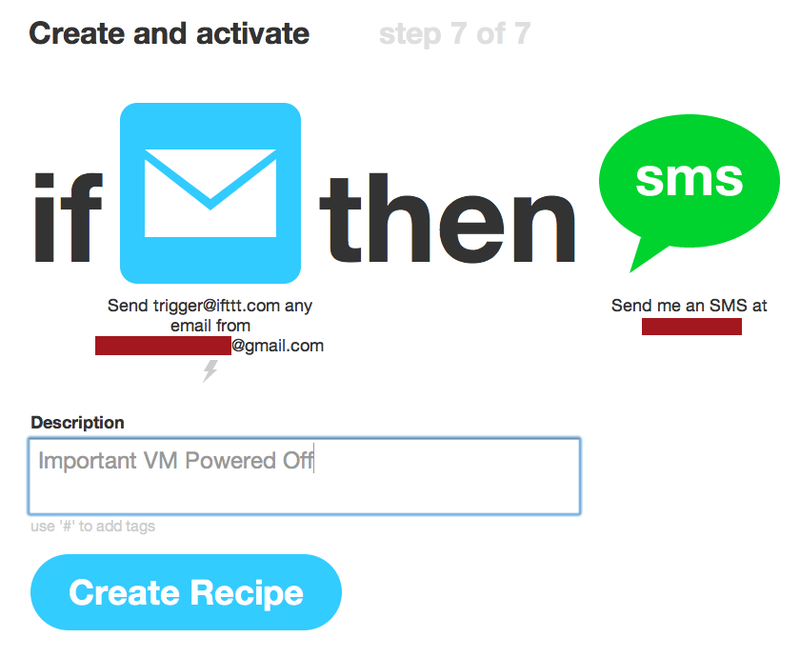 Step 2 - Create a new Recipe using email as the trigger and SMS for the action. The process is very straight forward, just follow the wizard and at the end you will enter your phone number for SMS notification and confirm with a code. Step 3 - Create a vCenter Alarm for the event you wish to trigger off of and set the email address to send to trigger@ifttt.com as noted in the Recipe. Step 4 - In my test, I created an alarm for a Powered Off event and went ahead and powered off a VM to generate the alarm. 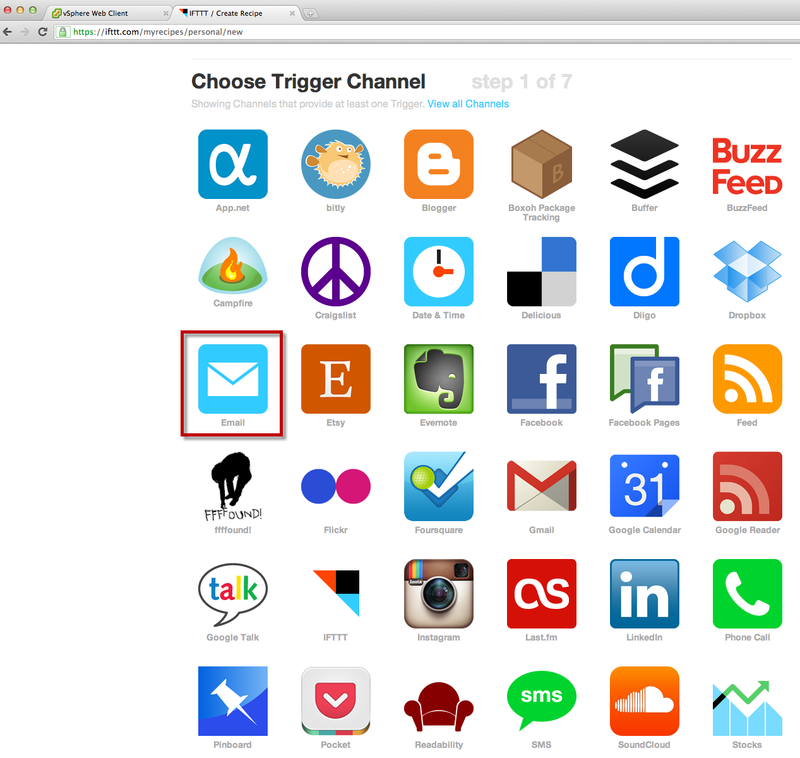 Step 5 - IFTTT checks the triggers every 15minutes. If you do not wish to wait 15minutes you can force a check by clicking on Check Now button in the Recipe. Step 6 - If everything was setup correctly, you should have received a text message with the details of the vCenter alarm. In my Recipe, I configured it to only send the Subject which contains everything you would need to know about the vCenter alarm, at least for you to decide whether or not you want to investigate the issue. The possibilities are pretty much endless in terms of the triggers and actions that you could create with IFTTT, I even created one for my ghettoVCB backup notification. The only downside that I noticed while giving IFTTT a try is that the trigger check is every 15minutes which could be a bit long for things requiring immediate attention, but I also read that there are certain Recipes that supports a "Quick Trigger" which would then execute immediately upon receiving. I think for a free service this is very cool and much easier than setting up your own SMS system. I would recommend giving IFTTT a try and see what cool Recipes you can build and integrate with your VMware or other environments. SMS is one of the best communication medium in day to day life. I like to send SMS to all friends. I like to utilise SMS services by sending greeting and notifications through SMS. thanks for the info.